•	He is currently Vice-President in WHO Framework Convention on Tobacco Control ( WHO-FCTC) ( 2019-2020 ),Geneva, Switzerland. He is former Director General in Department of Public Health and Department of Medical Services( 2016-1018 ) , Myanmar. He was Member in Malaria Policy Advisory Committee ( MPAC ) ( 2013-2015 )in Global Malaria Program ( GMP ), Geneva , Switzerland . He was Country Coordinating Director ( CCD )( 2012-2014) in Asia Collaborating Training Network in Malaria ( ACT-Malaria ) base in Manila , Philippine. 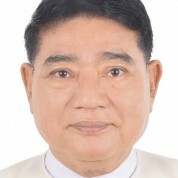 He was Chair in Malaria Technical Advisory Group ( Malaria – TSG )( 2011-2014 ), Myanmar. He was voting member in Regional Steering Committee ( RSC ) (2013-2015), Greater Mekong Sub-region Artemisinine Resistance Initiative ( GMS-RAI ). •	He is Malaria Experts and Public Health Specialist .He did his M.B,B.S( 1985 ) and Master Degree in Public Health ( M. Med. Sc – Public Health ) ( 2003 ) in University of Medicine (2) ,Yangon, Myanmar. He studied malaria parasitology and medical entomology in Jichi Medical University ( 2008 ) , Japan. He also studied leadership, public administration and management in Crotonvill , GE training Center in New York ( 2013 ) and World Bank ( Headquarter ) ,( 2017 ) Washington, USA.